Welcome to Sammi Nails, where we offer the most luxurious manicures and pedicures as well as gentle professional waxing services! 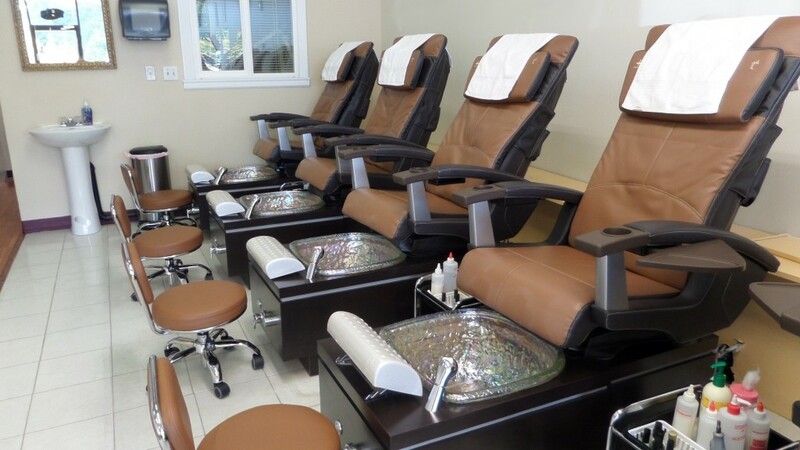 Our new pedicure chairs are the most comfortable you’ve ever tried. The multi-setting back and neck massage chair gently relaxes your stressed and tired muscles while your feet soak in a warm, herbal essence bath. Multiple manicure stations with relaxing Executive chairs are waiting for you. Just a small sample of our colors! Choose from an amazing array of over 1000 beautiful polish and gel colors! We carry a wide selection of standard and metallic colors as well as pastels and fun, eye-catching tones. Bold and bright, smooth or sassy, you’re sure to find one that suits your style! We proudly feature SNS Products, including Gelous Color dipping powders! “So happy to find Sammi Nails. So warm and friendly that I felt like I had been a customer for years. In and out after a mani and pedi in just over 1 hour. My nails are perfect. Definitely coming back.” -C. H.
“Sammi and the girls are doing an amazing job every time! Not only the service is great but the atmosphere itself is fantastic! It’s always a pleasure and fun to come here.” -Maria S.
“Best nail salon yet! Penny and Sammi greeted me so warmly. Had a wonderful pedicure and quality shellac manicure. I felt like family to them. It was my 1st time and I will be back every time! So clean and professional. Also love the hot stones on my feet.” -Terry G.
“Service is always efficient and friendly. They take time to listen to the needs of their client and provide a relaxing and caring atmosphere. I had a nail issue and received help with it to correct it. Two weeks later, no more problem. I also asked if they had a nail product that I use but have trouble finding. Sammi ordered it for me and I had it the next time I went in so I could have it at home. These ladies take what they do seriously and truly care about the experience the client has.” -Karen F.
“My daughter and I dropped in on a weekday for pedicures. Sammi and her staff were very friendly we had a relaxing time. They did a great job and we’ll be back!” -Stacy B. “I loved it here!!! I’ve gotten everything from acrylics to gel to pedicures to eyebrow waxing and I keep coming back….” -Kaylen G.
“Great service, good price , and I am very happy with my pedicure.” -Kristen T.
“We have been going to Sammi’s Nails since it opened. Amy and Sammi are so friendly and they always make sure we are happy with our nails.” -Scott B. “Sammi nails is by far the best nail place I have been! I have lived in this area my whole life and have been to MANY different places and no one is more friendly and accommodating. They are great at what they do. I bring my whole family here including my children and it always a great experience.” -Mollie K.
“The ladies here so friendly and do awesome work! Sammi, the owner is so kind and makes you feel welcome. You can tell she cares about providing a good client experience. I’m always pleased with the outcome.” -Ceci O. 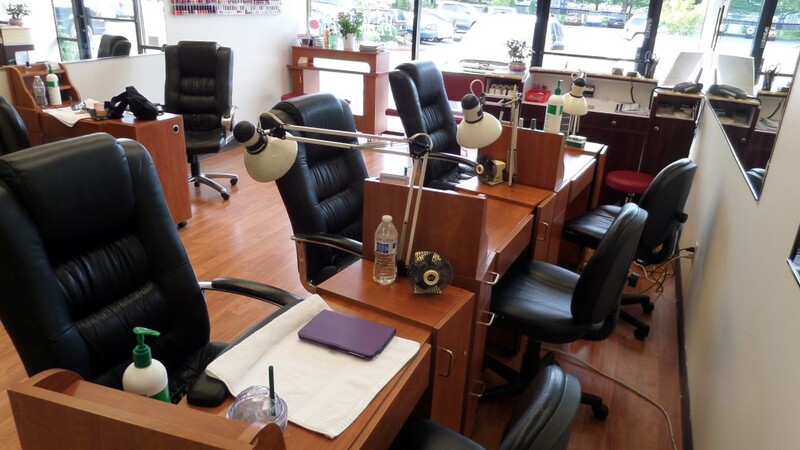 “I have been to quite a few nail salons, but Sammi’s is my favorite. The ladies are always so nice & inviting. My favorite place to get my manicure/pedicures done! They will have you wanting to come back again.” -Jessica V.
“Visited first time. Received the “Classic Pedicure”. All went quite well and was enjoyable. The skilled procedure was most appreciated. Very charming and personable staff. Intend to return for another session. Looking forward to it.” -John A. “Best mani-pedi I have ever had. I drive out of my way to come here every time. I have tried to find other places closer to home, but nothing compares. They are so thorough and detailed. With such a variety of pedicure treatments, you can have a relaxing spa experience every time. The ladies are amazing and so great at what they do!” -Danielle D.
“Wonderful, kind and careful, best in the area in my opinion. Clean, great selection of color, great hours and location.” -Tlea D.
“For a relaxing, professional Mani/ pedi Sammi’s nails is always going above and beyond to make me feel at home, welcome and they do such a great job. My nails always look amazing and I leave feeling like I had a day at the spa. The hot stone massage is by far the best in town and I send all my friends and family because they never let me down.” -Ivy R.
“Love this place! Sammi and Amy are amazing they always make me laugh and always do a FABULOUS job!” -Camille C.
“This is the best salon with affordable price! They have great people with great attitude. Also Sammi did a great job on waxing my eyebrow, it turned out amazing. Thank you Sammi and I will be coming back more often. I recommend anyone who are looking for a nail salon should try out this place.” -Thao D.
I’ve been coming here for about two years I think?? They rock. You get what you want for a super reasonable price and everyone is so nice oh my goodness. I love them! !” -Kaylen G.
“The owner and nail techs are all so sweet and friendly. My gel manicures don’t chip and their pricing is reasonable compared to other shops in this area. I’ll be back!” -Joanie M.
“Conveniently located and filled with the sweetest technicians in Mill Creek!!! They always greet you with a smile:). Their prices are very reasonable, but the level of service, is above and beyond!!! Check this place out- if you haven’t already! !” -Rox C.
“I’ve been coming here for about two or three years now (which says a lot!) and I love all of the ladies who work here. Every time I come in, they remember my name, ask how my family and I are and genuinely care about us. 🙂 I also came in for a pedicure and fill right after work, which ended up keeping them 15 minutes past closing but they took their time and didn’t make me feel rushed at all. I even told Sammi she could charge my card while I was drying my nails but she told me it was no problem and not to worry. 🙂 Very kind, thoughtful and will do anything you ask for! I love these girls and it’s a shame I moved farther away or I’d be there way more often!” -Kaylen G.
“Sammi is my nail place when I’m in Washington. They do a great job. My nails and toes always look good plus it is very relaxing experience. (Coupled with brunch at the Rusty Pelican with friends and you can make an afternoon of it. )” -Linda C.
“Just went to Sammi Nails. Had my nails done by Amy. She was SO fast and proficient. And the design she did was simply awesome! I’ve been getting my nails done for decades. She did such a great job. Just felt she deserved a shout out!” -Pat B. “This salon is great, not just because the products are great but because the staff is excellent. I have an allergy to acrylic and this salon offers SNS. I’ve been to many nail salons as I’m 48 years old and these women are the sweetest. They are like family to me now and I’ve only been going here a few months. Sammi is outstanding. She is adorable and wants you to have a comforting, relaxing experience while she provides the best service not to mention the prices are very reasonable. Give this place a try….you won’t go anywhere else once you have.” -Dawn C.
“I’ve been going to Sammi Nails since they opened. The staff is professional, knowledgeable, and the finished product whether you do a manicure or pedicure is excellent. I like that they have 3 different levels of services so when I have time, I go “Gold” and when I’m short for time, I do the regular mani/pedi. This shop is the cleanest I’ve ever been in and the State of Washington agrees – their inspections rate 100% and it doesn’t get better than that. I recommend calling in as they have a large clientele, but when I have dropped in, they always fit me in. Sammi has earned my loyalty and you’ll find me there at least twice a month. Go and enjoy! !” -Sheryl B. “I love Sammi Nails! I feel like they enjoy seeing me and are so kind. My shellac stays on longer than other places I have been. They have so many colors to choose from and are quick. 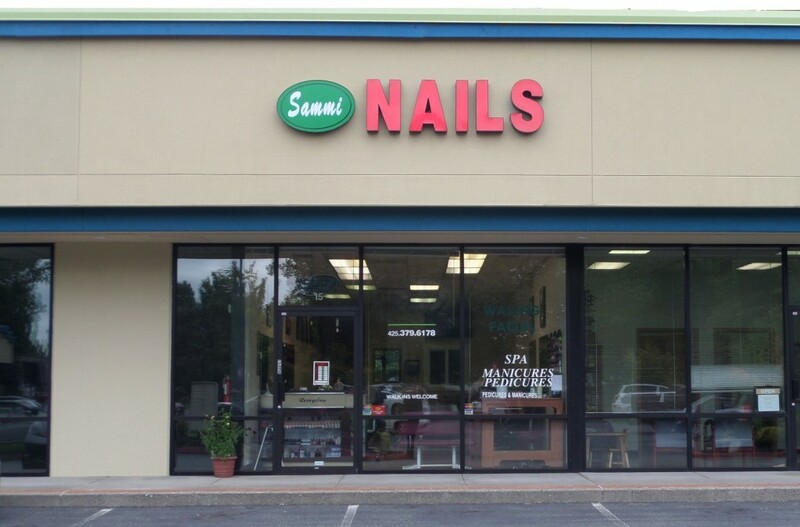 I highly recommend them!” -Kyla L.
“I have been going to Sammi Nails since they opened. Sammi and Amy are warm and friendly and do a wonderful job! Their shop is spotless and well-organized, which I really appreciate. I am a fan of the gel manicure, which lasts a full two weeks. I get regular pedicures, unless I am going on vacation and then I will get gel on my toes as it stays shiny with regular sunscreen use and the wear and tear of sandy beaches. I recommend Sammi Nails as I am always treated like a valued customer!” -Erin H.
Walk-ins are always welcome, or call to make an appointment- let us pamper you the way you deserve! Copyright © Sammi Nails. All Rights Reserved.